The epigraph is taken from John Montague’s The Water Carrier in which the poet as a child fetched water for domestic use from two outdoor sources and recounts the emotions he still feels. Heaney’s Fosterling is here to sing the praises of that same landscape. The poet returns to the lost domain of childhood as a fosterling: before he reached twenty he had left his farming background behind and moved to Queen’s University Belfast as an undergraduate. Taken over by an entirely different lifestyle he would never permanently return to his childhood home. Now over fifty years of age, a poet, he remembers fondly the wall-print of an Irish landscape hanging in his Anahorish first school classroom. Heaney confesses to moments of despondency and the folk lore that cheered him up. He is in transition, looking at things anew, and his collection is poised to move into ‘Squarings’, four groupings of twelve poems of 12 lines each, almost all of them fillled with ‘air’, ‘dazzle’ and ‘light’. 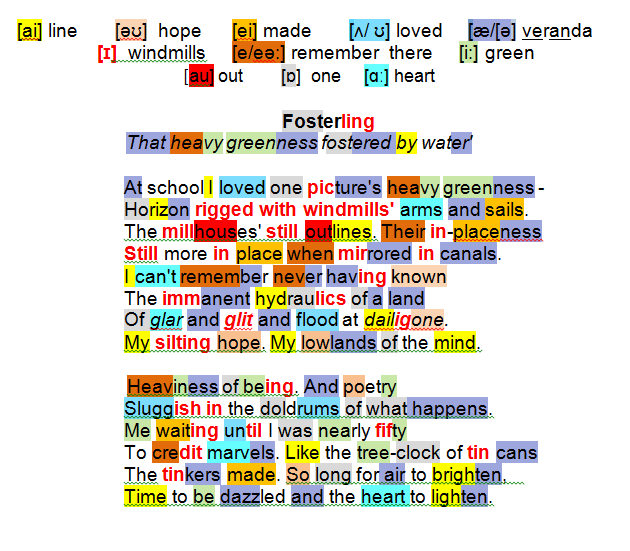 The elements that captured Heaney’s young attention were predominantly born of the rain-soaked Irish climate: its profuse setting (heavy greenness); its images of windmills standing like boats (rigged … arms and sails); its symbols of steady Irish industry (millhouses’ still outlines) especially those in watery settings (Their in-placeness/ Still more in place when mirrored in canals). There was not a single Irish phenomenon (I can’t remember never having known) where infrastructure was not founded on water (immanent hydraulics of a land) with its dialectal lexis of mud and ooze (glar and glit and flood at dailigone). Living distantly and caught up in a different clockwork weighed on Heaney’s mind (silting hope), creating moments of depression (lowlands of the mind) and lethargy (Heaviness of being) reflected in listless poetic output (poetry/ Sluggish in the doldrums of what happens). He scolds himself for having waited so long (nearly fifty) to ‘see again’ and acknowledge what was extraordinary around him (credit marvels). He provides an uplifting example (the tree-clock) [see below]. He intends Part II of Seeing Things to be a place where light and life prevail (air to brighten), where wondrous spectacles appear (Time to be dazzled) and the spirits soar (heart to lighten). The poem’s final word will adapt to become the title of the first Squarings‘ sequence. In conversation with DOD (317) Heaney reflected on the poems in Seeing Things that ‘credit marvels’: It all started from that image of ‘the tree-clock of tin cans / The tinkers made’. Not a very clear image, not even to me. I’d heard a story years before, in Wicklow, about people in a certain district who’d made a pact with the devil. I can’t remem­ber what boon they were granted, but in exchange they agreed that the devil would come at a certain time on a certain day to collect their souls. And of course as the hour neared the panic heightened until, at the last minute, this band of tinsmiths – tinkers – landed and proposed to build a fantastic tin clock in a tree and set the time wrong. Then once that’s done, the devil arrives and discovers he has made a mistake, has arrived too late and broken the agreement, so the people are released. What stayed with me was the image of that strange flashing tin­ flanged tree, just asking to be written about. It reveals moments when the poet needed a metaphorical hand up from moments of depression: the tree-clock pointed an Orphic hand up towards the light.